The Internet tells me there are more than 40,000 varieties of rice, which seems entirely plausible, a reasonable number. It might have been much higher, given that for some three billion people, rice is part of the every day, rice is elemental. Once upon a trip to India, I remember going to a local Kolkata market in the early evening. We are visiting the neighborhood purveyor of high quality and specialty rice. He is trusted by my family to sell unadulterated basmati rice, rice that is free of rot or bugs, uncontaminated by the cheap or barely edible. A table is placed squarely in the middle of his shop, which is large, a three sided room that is perhaps 12 x 12. The shop owner sits on the top of this table, his haunches in a deep squat. Crammed into every available space are bags and bags of rice – tall, rough burlap bags that resemble fat barrels, a gathering of still, corpulent sentinels patiently waiting with their mouths open wide. Each bag contains a different kind of rice. Darkness has set in, but the light inside the stall gives the rice an unexpected incandescence, and the room is awash in circles of yellow and gold, creamy beige and light browns, pale pearl and improbable pink. My mother and aunts are buying rice for the every day and for the occasions to come. They barter back and forth with the shopkeeper, and their negotiating disappears into the broader noise of the street. I am somehow mesmerized by these tiny grains, each with their own smell, texture and personality, trillions of grains for billions of people. Like sand. Like stars. I am momentarily stunned and want to pick up fistfuls of rice from each bag and let the grains run through my fingers. I want to touch them all. That evening, my aunts purchased basmati rice for Bengali Mishti Pulao. Basmati rice (Bengali: বাসমতী ) is popular these days, and is available pretty much anywhere, (even Target). But not all basmati is created equal. Look for rice that is long and slender, and grain that smells of grass and yesterday’s flowers. 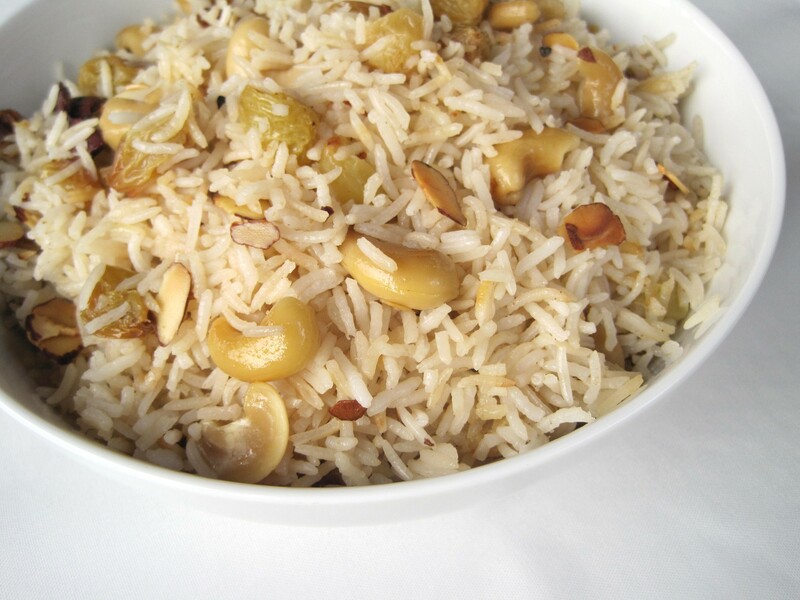 When cooked, Basmati is a fragrant revelation, with notes of spice and jasmine. Basmati is usually reserved for special occasions, and if one can make mishti pulao well, then one can leave an imprint. Bengali mishti pulao pays tribute to the Bengali temperament, and those who love mishti pulao do so ardently. I recently found a very good basmati that does not break too easily and cooks into feathery perfection. The rice came in a large burlap bag, and before I put it away, I let it run through my fingers. Rinse basmati and drain water. Set aside. Dry toast the almonds, shaking gently in a pan, about 8 minutes. Set aside. Melt ghee in a saucepan, add cardamom, cinnamon stick, cloves and tej leaf until fragrant, about one minute. 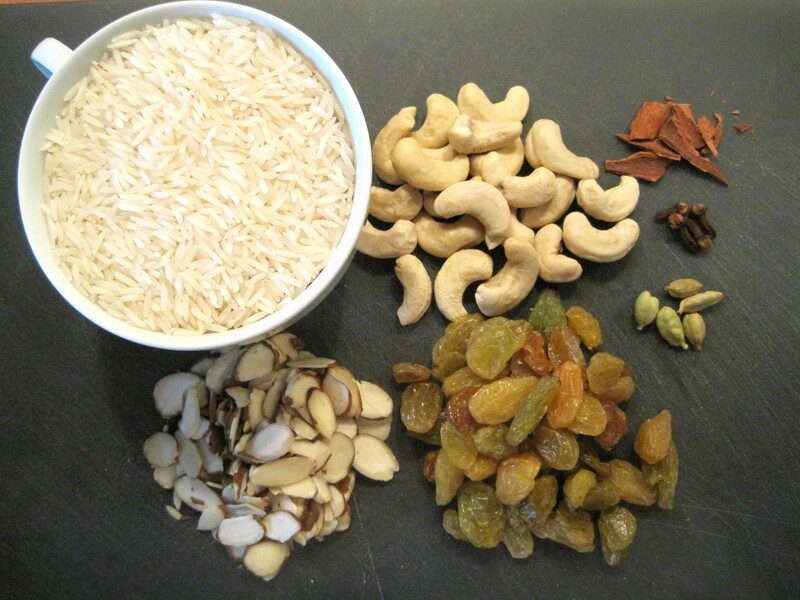 Add cashews and raisins and cook gently for a few minutes. Add rice, salt and sugar, stirring gently to coat. Fry the raw rice for a few additional minutes, then add water. Turn heat to medium-high. When mixture reaches a low boil, cover and turn the heat down to a low simmer. Set timer for 15 minutes. When the rice is done, stir in the toasted almonds. Close your eyes. Inhale deeply. 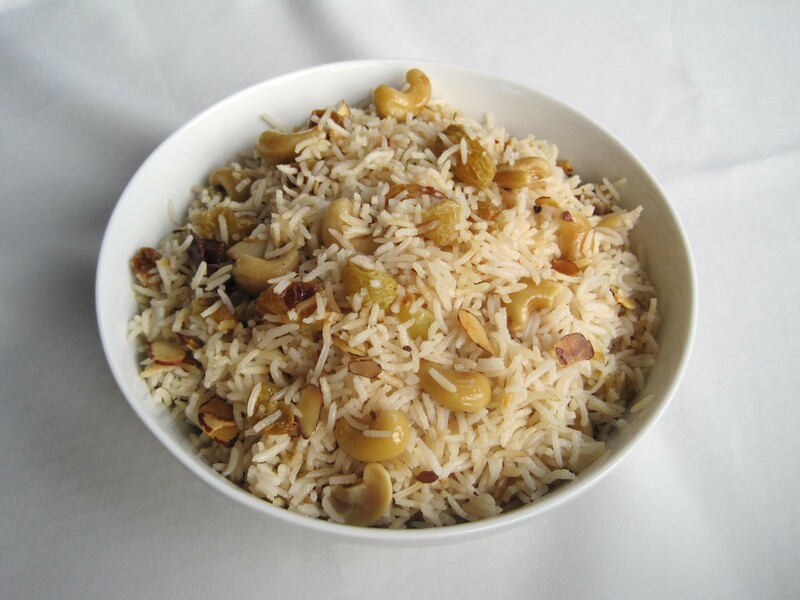 This entry was posted in Bengali Food, Rice and tagged Basmati Rice, Bengali Mishti Pulao, Cashews, Pulao. Bookmark the permalink.